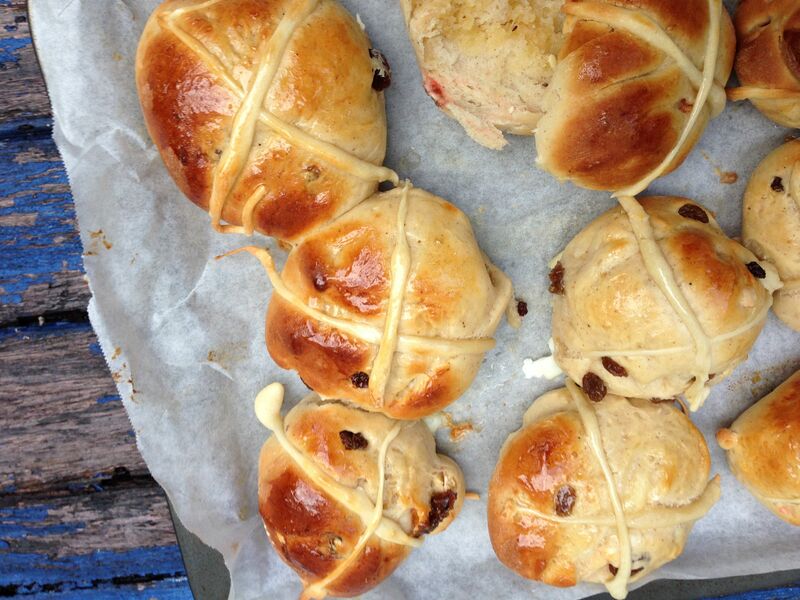 I am very excited to have – almost – mastered hot cross buns! 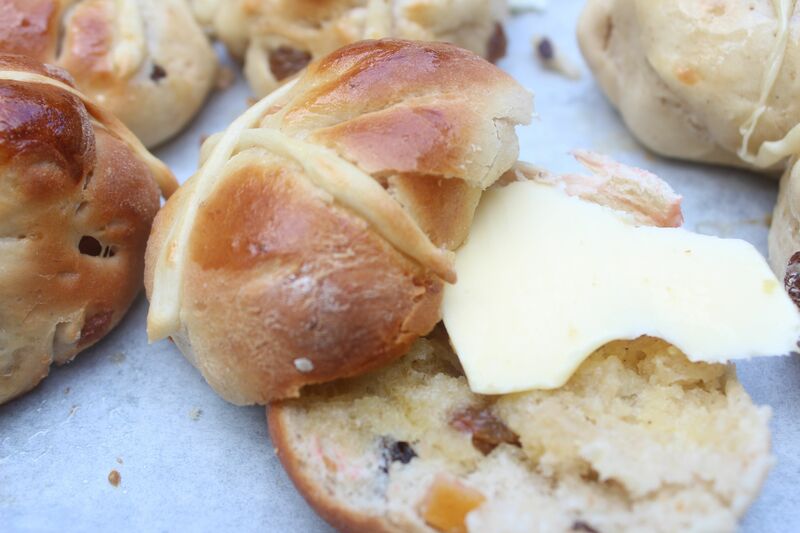 In previous years when Easter approached I have sought out hot cross bun recipes looking for the “perfect” bun. Spiced, fruity and not too difficult to achieve. I have ended up with clunky door stops or miserable shriveled little balls. I even tried using a bread machine with little success…the machine is safely stowed away, gathering dust, in the back of a cupboard now. I am very happy with the result! They taste good and even look like hot cross buns! I tweaked a little: the 220 degrees C temperature seemed very hot, so I took it down to 200 degrees C.
Also, I halved the “cross” ingredients : 50g instead of 100g flour and 25 ml water rather than 50. You can make plenty of crosses from the smaller quantities. After tasting, I think that the fruit quantities need increasing and the spice quantity definitely needs to be more. I used cinnamon and nutmeg instead of mixed spice, too. These latter comments are a matter of taste – I have left Jamie’s fruit and spice quantities as is in this version, but I will be putting more of each in next time I bake hot cross buns. 2 tsp mixed spice or 1 tsp each cinnamon and nutmeg. Mix 1 teaspoon of the sugar with the yeast and 150ml tepid water in a jug until frothy. Sift the flour, 1 teaspoon of salt and the mixed spice into a large bowl, then add the dried fruit, peel, orange zest and remaining sugar. Make a well in the middle and pour in the yeast mixture, then add the beaten egg, melted butter and 40ml warmed milk. Using a fork or wooden spoon, stir in a circular motion until you have a dough. Add a little more milk if the dough is too dry. Place the dough on a clean surface dusted with flour and knead until it is smooth and glossy, about 5 minutes. Place the dough in a large mixing bowl and cover with a clean, damp tea towel. Leave in a warm place to prove until it has doubled in size, about 1 hour. Knock the dough back and knead again to its original size. 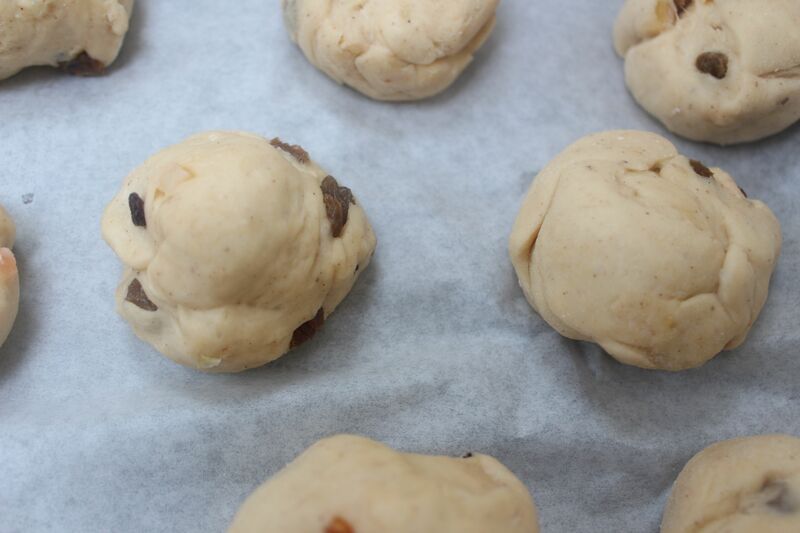 Divide the dough into 12 evenly sized pieces and shape into round buns. Place on a lightly greased baking tray, spaced well apart. Cover with a damp tea towel and leave to rise again until doubled in size, about 35–40 minutes. Meanwhile, preheat the oven to 200 degrees C. For the decoration, place the dough or shortcrust pastry on a clean surface dusted with flour and roll into a sausage about 1cm thick. Cut the sausage in half, and cut each half into 6 pieces. Roll out each piece again to make 2 thinner, 5mm strips of about 8cm long. You should have 24 strips in total. 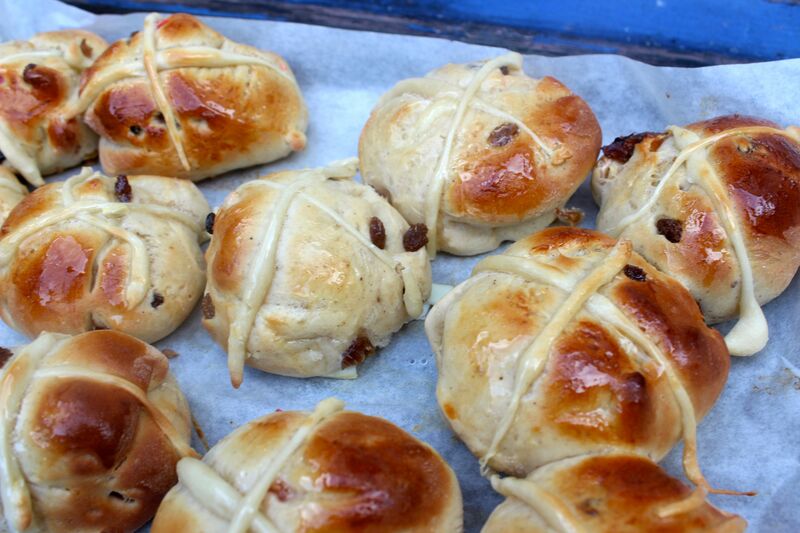 Brush the risen buns with some of the beaten egg and lay the dough strips on top in the shape of a cross. Brush with the rest of the beaten egg and bake for 15 minutes, or until golden. Meanwhile for the glaze, place the sugar and juice in a pan and gently heat until the sugar is dissolved and the syrup is bubbling. Brush the buns with the glaze. Eat immediately with lashings of butter, or serve toasted the next day. Posted in Bread, Breakfast, Buns and Scrolls, Jamie Oliver, Small Baked Things, Sweet Food and tagged cinnamon, Easter, hot cross buns, Jamie Oliver, mixed peel, nutmeg. Bookmark the permalink. I never had any luck with hot cross buns, either. These look great — you’ve inspired me to give it another try! This recipe is great, but I am going to try Paul Hollywood’s hot cross bun recipe next- very similar to Jamie’s but has a heap more milk. They were featured on the “Great British Bakeoff Easter Masterclass”. http://www.bbc.co.uk/food/recipes/hot_cross_buns_74750. They seemed to be very soft and moist!